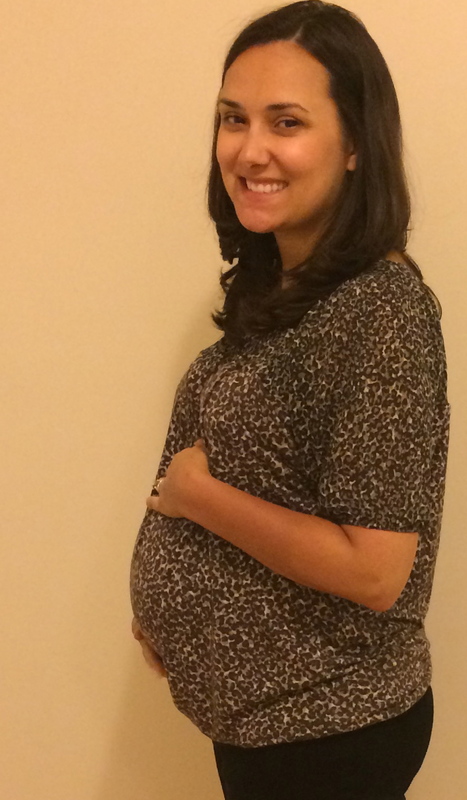 Many people say that pregnancy moves slow, but I’ve had quite a different experience. 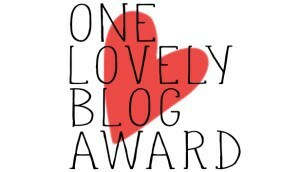 Every week seems to move more quickly and I’ve really fallen behind on my blogging! Although I haven’t been writing an update each week, I’ve definitely been enjoying this last stage of growing my sweet little girl. I’ve been very busy with trying to get everything wrapped up at work, childbirth classes, putting the nursery together, making sure I have everything I need for her arrival, and fitting in a few last minute trips. 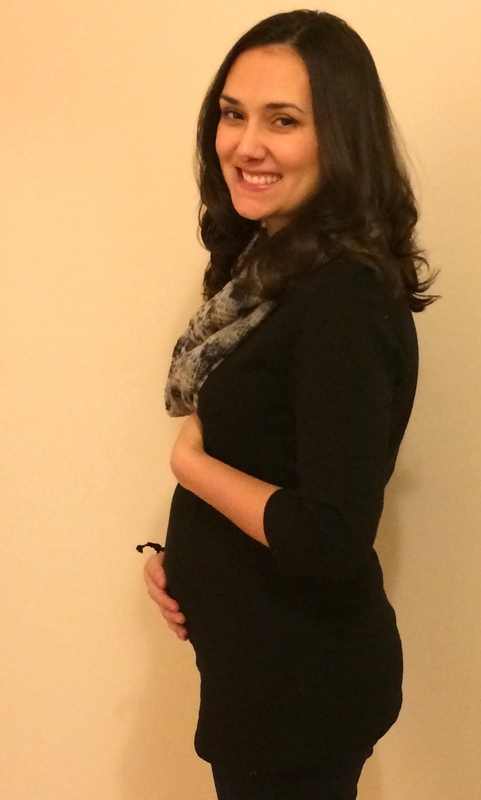 I’m going to do one big bumpdate spanning the past 5 weeks since I clearly cannot keep up with these weekly ones! As I slow down in the coming weeks I’m hoping to get back to the weekly updates. How Far Along? 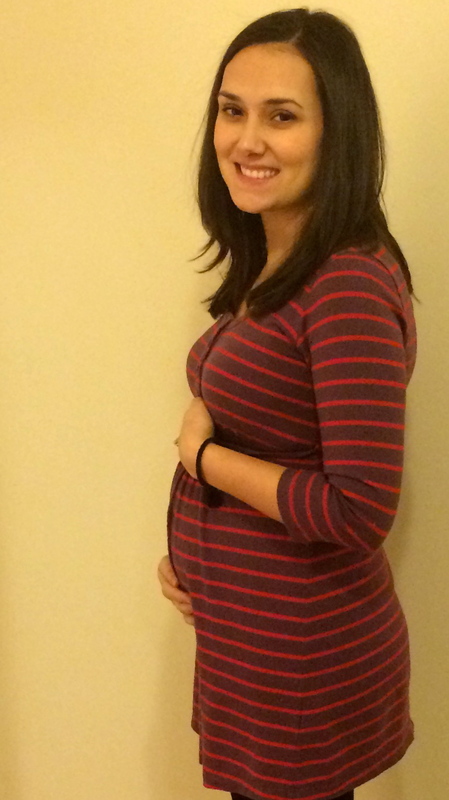 : 30.6 weeks! 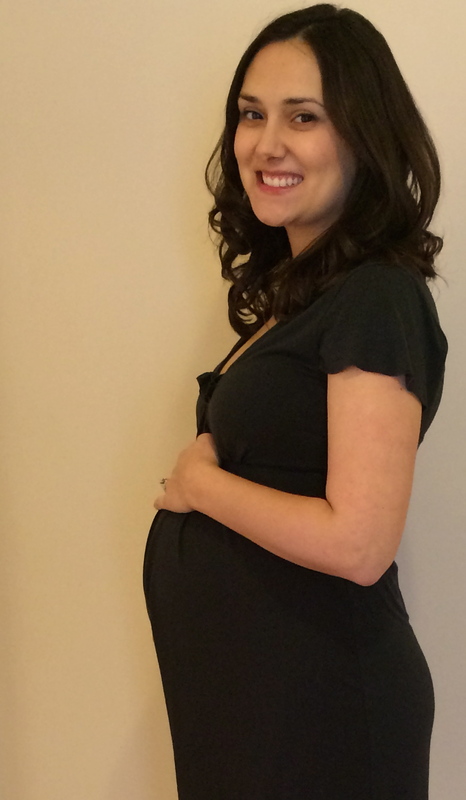 I cannot believe we’re in the single digit weeks until baby arrives. Total Weight Gain: +25lbs, yikes! Maternity Clothes? All maternity all the time! Around 27 weeks is when I really popped. Now I’m getting asked constantly when I’m due, etc. Stretch Marks? Still holding firm! Everything is feeling very tight so I won’t be shocked if they arrive any day now. Sleep? Sleep was good until 30 weeks. Now I’m having a lot of trouble getting comfortable with my big belly. Best Moment This Week? Too many great moments to pick one: Hitting the third trimester, spending quality time with hubby and my mom before baby arrives, feeling all of baby girl’s movements. Movement? : She was moving like crazy weeks 25-29. Lately I’ve noticed a little less of those large movements and more just kicks and punches. I think it is getting tight in there and she isn’t able to somersault like before. Food Cravings? : Still sugar! I found out at 29 weeks that I’m slightly anemic, but haven’t really experienced any symptoms. I started an iron supplement and am making an efforts to each more iron-rich foods. Baby Bump? 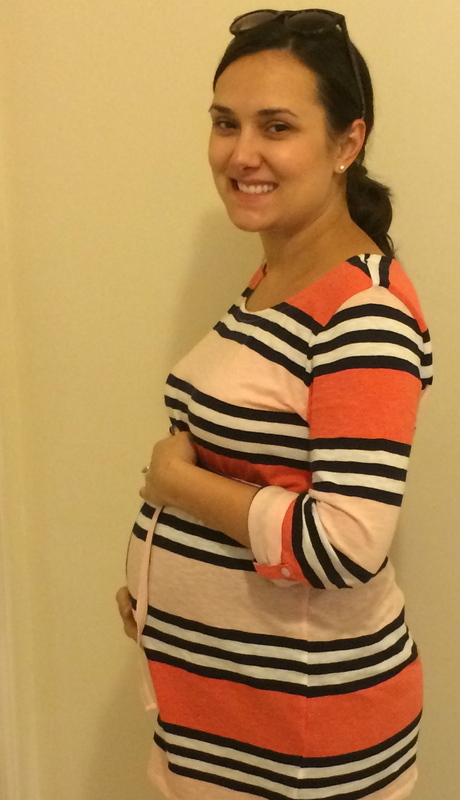 : See belly pics below, the bump is huge! Belly Button In or Out? : STILL IN! I can’t believe I made it to 30 weeks with it in. Wedding Rings on or off? 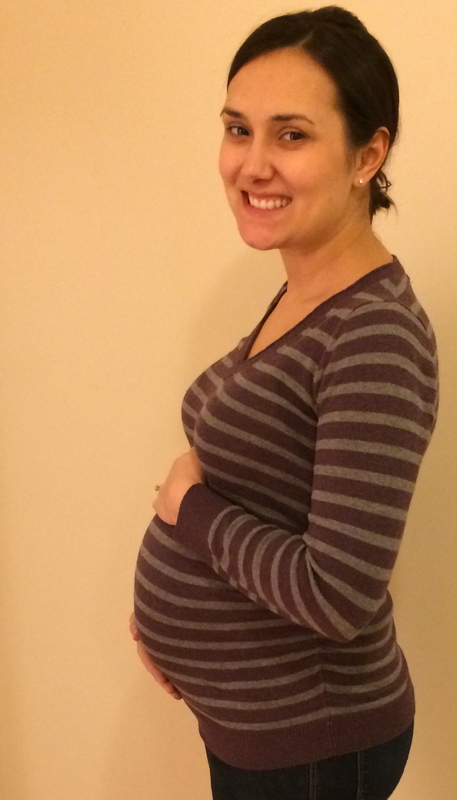 : Hands are still good, but my feel and ankles started to swell like crazy around 29 weeks. By the end of the day they are comical and I can barely fit them into flip flops. I can’t imagine what they will look like in 9 more weeks. Happy or Moody? : Very happy. I think I’ve reached the point where I’m letting the stress go and just enjoying the end of pregnancy. I do have my moments when I’m like “how am I really going to birth a baby! ?” but I think that is normal. Miss Anything? : The weather has been beautiful – perfect for a glass of white wine on the back deck! I do miss alcohol a little but not too much. Also missing bring able to move around quickly. It takes some work to get out of bed and waddle around. Looking forward to? : Back to back baby showers this weekend and next! Can’t wait to see family and friends! Also another ultrasound at the specialist at 32 weeks. Total Weight Gain: +12lbs. I got a little chastising from the doctor about gaining a bit too fast, so I’m recommiting to healthier eating and the elliptical every day. My prenatal yoga class also starts this week so that will get me moving. Sleep? Still good, minus the frequent bathroom trips. Best Moment This Week? So hard to pick just one, it was such a happy week! On Valentine’s Day morning, my husband and I were in bed and he felt her move for the first time. Such a special moment! It was also amazing to see the happy reactions from our families when we bit into our cupcakes and saw pink! It was very special to have both sets of our parents and my brother there for the big reveal. Movement? : Yes, she was moving all around at the ultrasound! Quite the active little lady. I’m feeling her move more and more throughout the day. Food Cravings? : Lebanon bologna with cream cheese. Weird Pennsylvania snack that I’m missing! Anything making you queasy? : Nope, feeling great. Gender Prediction? 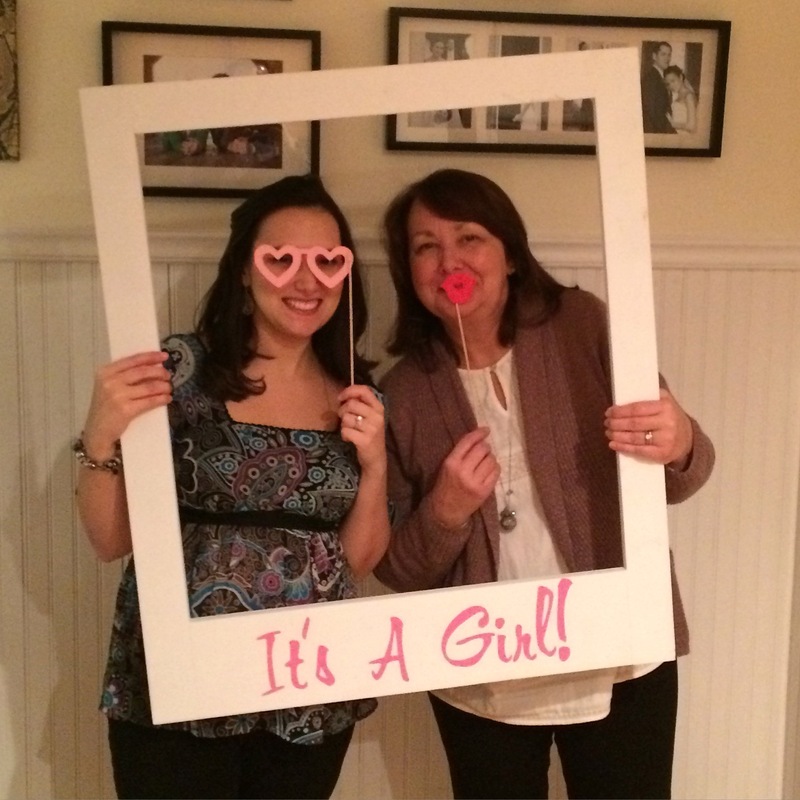 : Baby is a girl! My mommy instincts were totally off, as I was thinking boy the whole time. 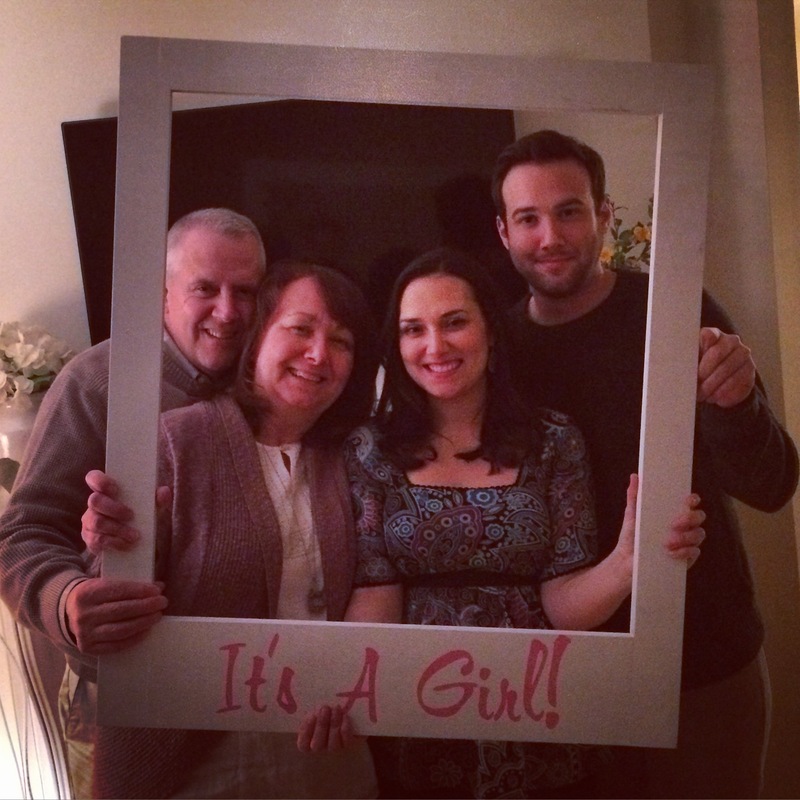 The grandmas were hoping for a little girl and they are over the moon! 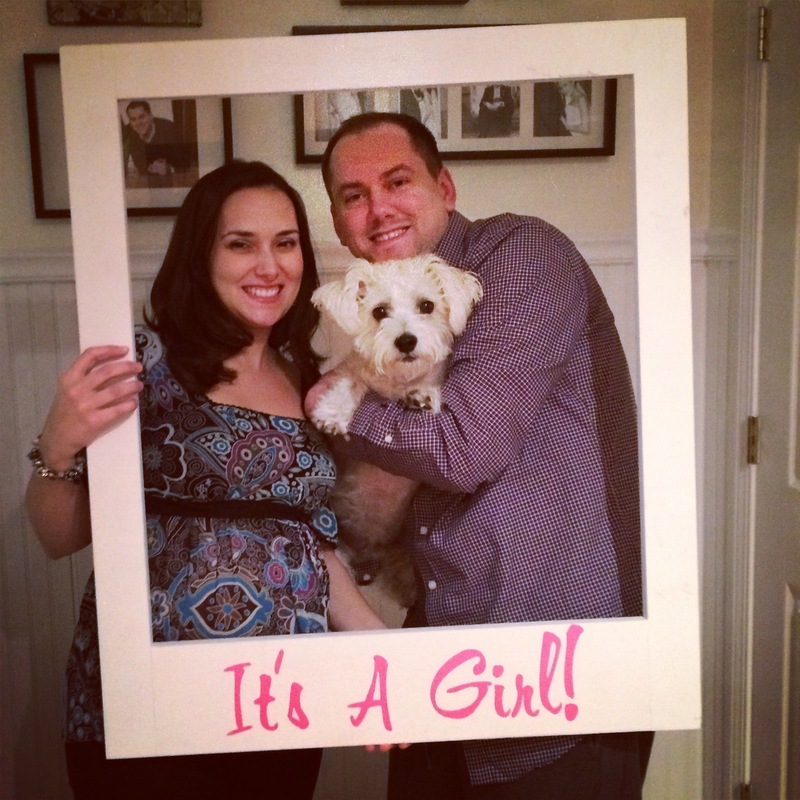 Mom and dad are overjoyed and we can’t wait to meet this little girl! Labor Signs? 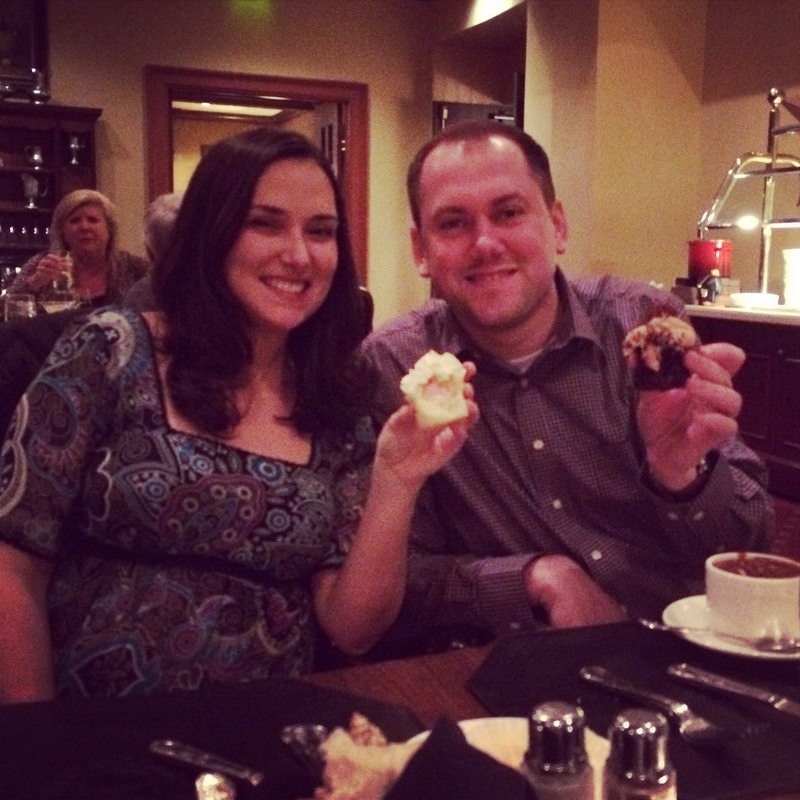 : Infrequent Braxton Hicks contractions. At out ultrasound, we found out that my placenta is low (not previa but very close to my cervix) so we’ll be monitoring that the rest of the pregnancy. Our specialist is very optimistic that it will move up as my uterus grows and shifts upward. Belly Button In or Out? : In and holding strong. Still have a slight double bump. I’m actually hoping it pops out so I can have one bump instead of two lumps, lol! Happy or Moody? : This was one of the best weeks of my life. Such a special time in our lives. Looking forward to? : Getting the nursery ready! Now that we know we’re expecting a little lady, I’m jumping into the planning and updating our registry. I honestly feel like I won the cute shopping lottery and the possibilities are endless! My mom and I went on our maiden baby girl shopping voyage this past weekend and did some serious damage! Maternity Clothes? Yes, all the time! Stretch Marks? Not yet, but the skin is definitely stretching. Belly button is looking strange! Sleep? Still sleeping well, knock on wood. Best Moment This Week? Seeing family at my Gram’s 90th birthday party! Movement? : Yes, feeling more and more every day. Food Cravings? : Still candy. God save me if I find out I have gestational diabetes. Anything making you queasy? : No. Baby Bump? : Yes! It is the real deal now. 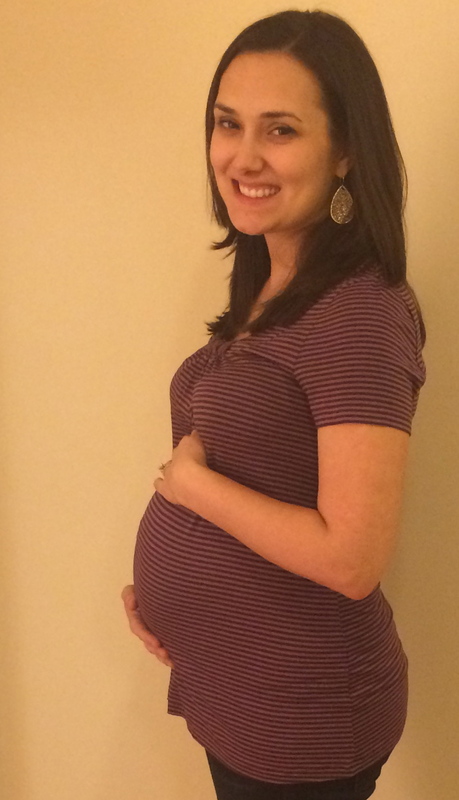 I don’t think there is any denying that I’m growing a baby in there. Gender Prediction? : Hoping to know on Friday!!! I had a dream this week that the baby was a girl. That was the first time this whole pregnancy that I got the girl vibe. Labor Signs? 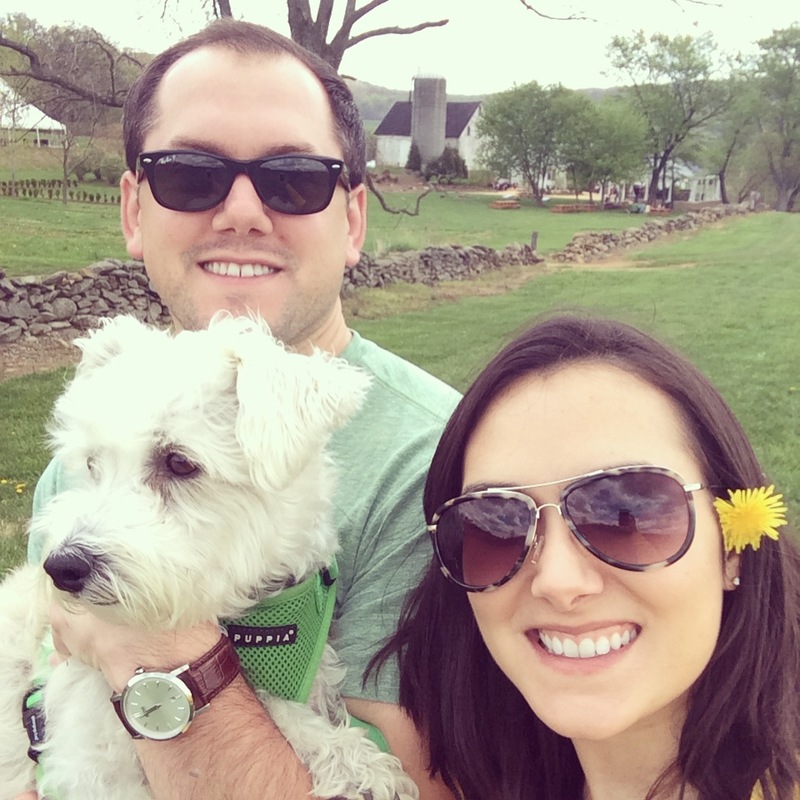 : I get a Braxton Hicks contraction every now and then. Belly Button In or Out? : In but getting bigger and flatter. Right now I basically have a double bump because my belly button still caves in. It is super attractive. Happy or Moody? : Feeling great and very happy. Miss Anything? : Lately I’ve been feeling so good that I’m missing running a little bit. Not enough to go out for a jog though, can’t really picture that with this belly! Looking forward to? : Anatomy scan! Praying for a healthy baby. Maternity Clothes? Yes. I need to expand my collection. Any suggestions? Stretch Marks? Nope, but skin is starting to get a little itchy. The freezing cold weather isn’t helping. Sleep? Not too bad this week. I think exercising is helping. I have had some heartburn creeping up. Movement? : Definitely. I feel the most activity after dinner until before I go to sleep. It makes this seem so much more real! I can’t wait for hubby to be able to feel it. Food Cravings? : Candy, which is very unusual for me. Valentine’s Day candy is everywhere and I can’t stop eating it. Anything making you queasy? : If I move around too quickly – bending over or rushing up the steps – I get a little queasy. Baby Bump? : Yes! 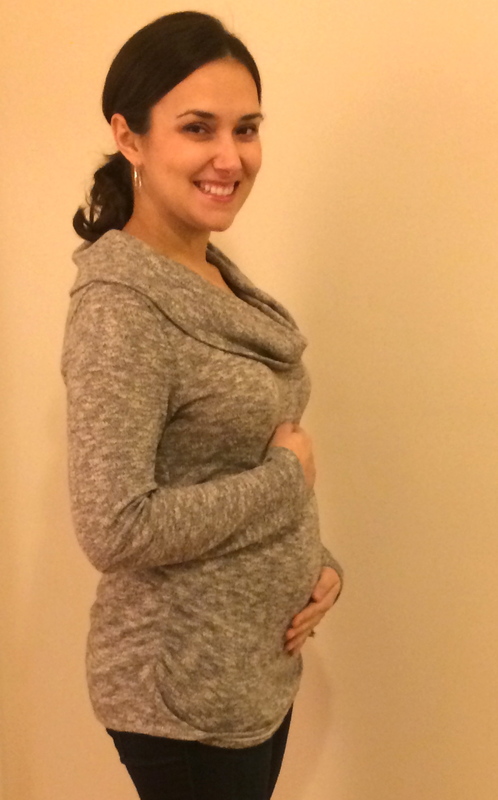 It is still looking like a small pillow covering my whole belly – hoping it begins to take shape. Gender Prediction? : Time will tell! 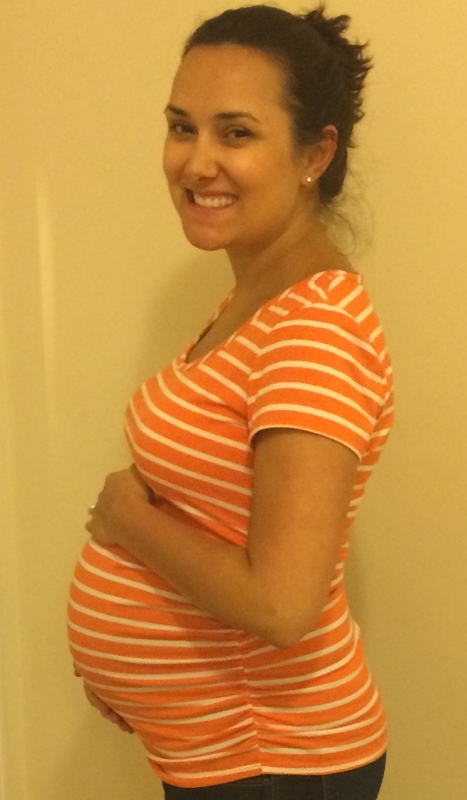 1.5 weeks to go! I’m still thinking boy. Labor Signs? : My Braxton Hicks (or whatever that was) seems to have resolved this week, thank goodness! Belly Button In or Out? : In but getting bigger and flatter. Happy or Moody? : Happy, happy, happy! Miss Anything? : Margaritas. I’ve realized that is 75% of the reason why I like Mexican food. Looking forward to? : A surprise 90th birthday party for my Gram next weekend! Baby is the size of: An avocado! Maternity Clothes? 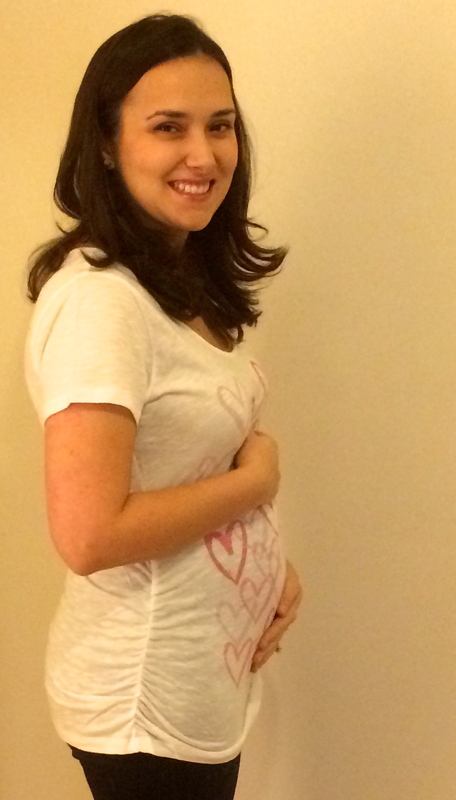 Yes, invested in AG maternity jeans and loving them! Still in regular shirts but they are looking a little silly. Best Moment This Week? A quiet, happy moment of anticipation in our future nursery, a room that has been an empty, sad reminder for the past few years. Movement? : I felt a little kick last night! Certain times of day I feel a bunch of tiny movements. Food Cravings? : Lemon anything, salads, really just food in general! Anything making you queasy? 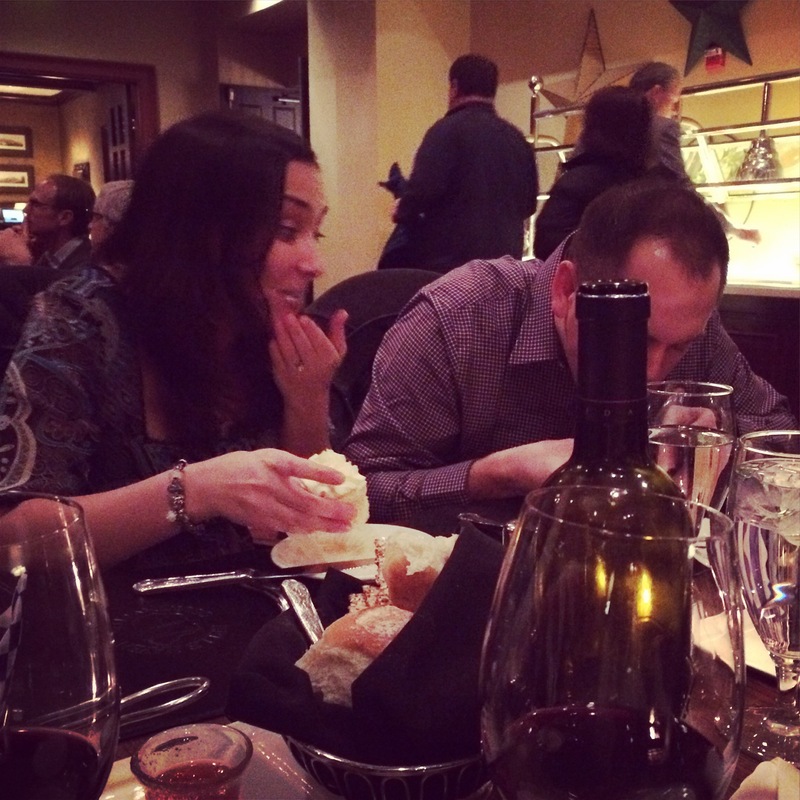 : When I bend over I still get a little queasy, but happy to say that no food or other smells are causing any dry heaving anymore. Baby Bump? : Yes, it feel like my belly is just growing outward in all directions. 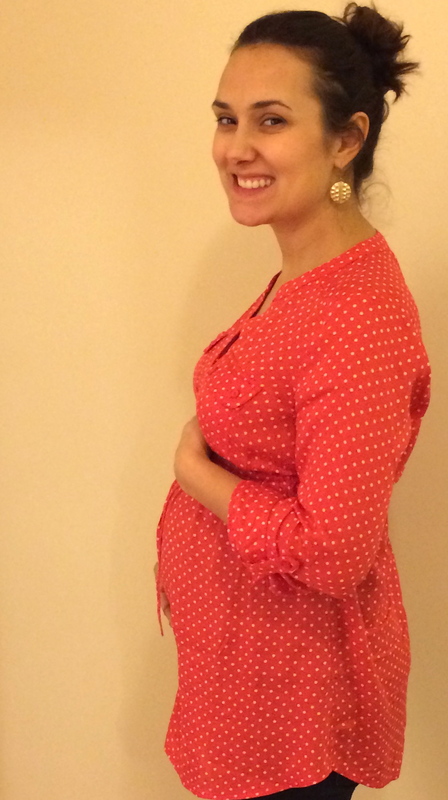 Hoping this bump will start to take some shape soon so I don’t just look large and in charge. Gender Prediction? : I think boy, hubby thinks girl. I’m getting so excited to get to know this little one! Labor Signs? : No. I have been experiencing Braxton Hicks contractions 2-4 times per day. My doctor said this is normal and isn’t a concern unless they are happening regularly (4-6X an hour). A little concerning but trying not to stress about it. Belly Button In or Out? : In but stretching out. It is weird to be able to see in there! Happy or Moody? : Happy! I have noticed this week that my hormones are back in full swing and I get emotional very easy, similar to how I felt during much of the first trimester. Looking forward to? : Anatomy scan in 2.5 weeks, getting started on the nursery and registry once I know who this little one is!